To reverse the direction of rotation of 3-phase induction motor is by reversing the polarity of one of the incoming voltage to the motor. try to look at the picture below. In the picture above shows that the motor will rotate to the right (forward) if theterminal winding / winding motor receives voltage RST with R connected withU, S connected to V and T connected with W. And the motor will rotate in the opposite direction (reverse) if terminal winding motor receives voltage RSTwith R connected with U, S connected with the W and T are connected to thevoltage V. in other words RST reversed into RTS. Reversing the polarityothers can also, like R with S or R to T.
To change or reverse the polarity of the voltage that is typically used RSTcontrol circuit is a series of mechanical and magnetic contactors. And asmotorcycle safety also mounted motor protection (thermal overload). Note themain diagram drawing / power forward following reverse. The figure shows that the motor will rotate to the right (forward), if K1 works. Currently working contactor 1, the voltage RST will go to the motorsequentially. 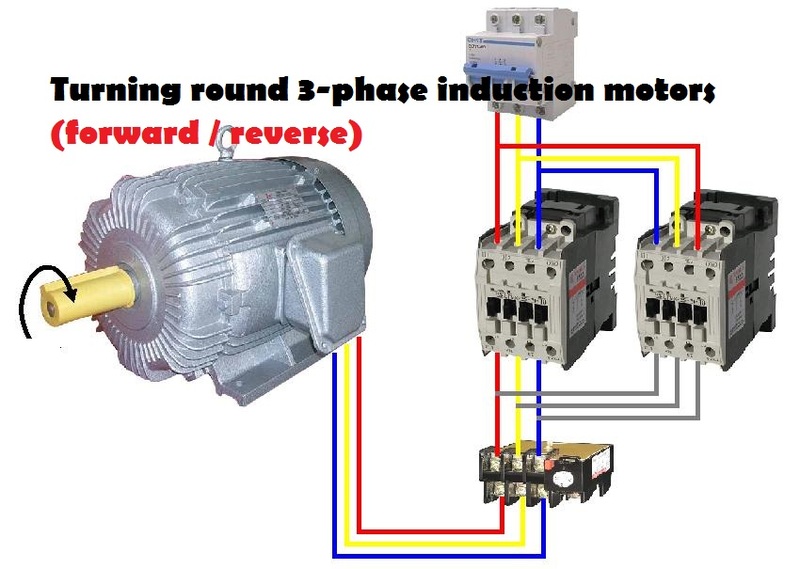 And the picture above also explains that the motor will rotate to the left (reverse), if K2 (contactor 2) work. K2 works when the RST incomingvoltage polarity reversed kemotor will be TSR. (See picture above) .and what happens is the motor will rotate to the left. To regulate or control the two contactors are needed forward reverse control circuit. And below is a control circuit diagram of the forward reverse. Consider the following picture, and understand how it works. Working voltage contactor coil control circuit in the picture above is 220VAC. So that the picture above to get the power supply phase (R) and zero (N). But usually also used the contactor coil 380VAC working, so it should be given the power supply voltage line (phases). Voltage line here means R-S, R-T or S-T. This voltage depends on the actual granting of the coil can also kontaktornya because the coil working voltage of 100V, 200V and so on. In the picture above shows that the electric current will flow and activate K1 if on1 button is pressed. Although on1 released K1 will remain active, this is because there interlock of NO auxiliary contact (K1) which is mounted parallel to on1. So that the electric current flowing through the contactor coil to NO auxiliary contact (K1) is. K1 active when it means the motor rotates to the right (forward). From the picture above also seen the NC auxiliary contact (K1) which is mounted in series with the coil K2, and vice versa NC auxiliary contact (K2) mounted series coil K1 premises. NC auxiliary contacts here serves as a safety interlock. 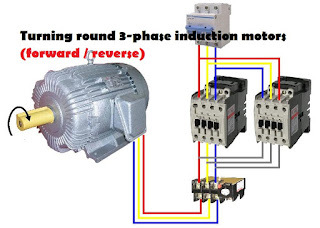 For example, if on1 pressed and K1 active (motor rotates forward), although ON2 pressed the electric current will not flow to the coil K2, because NC (K1) has been opened. And for reverse rotation (reverse), then the OFF button must be pressed in advance, so that K1 off and ON2 button can now be pressed to activate the coil K2. So that the motor can rotate to the left (reverse). As well as to restore the motor rotation to the forward.